I got Ginger, my female British Lab, when she was 11 months old. She is now just a little over 3 years old. She came from a family that raises only British Labs and trains them for various things. They were in northwest MS. I have now moved back to KY. Occasionally they had a dog that would rather be a pet, thus I got Ginger. Just like all labs she is a very sweet-natured dog, incredibly intelligent, and doesn't have a mean bone in her body. She has quite a "vocabulary" of words she understands and knows. Sometimes she knows what I'm about to do. This includes taking her for a ride in the car, going for a walk, and of course treats and food. I had never owned a pet before getting her so we've learned together. She is now trained where she has the run of the house when I'm gone. But, early on she chewed up things such as cds, remote controls, and a big stuffed chair. Her favorite toys are stuffed animals. I usually buy the ones that make sounds, but her bite is so soft she rarely makes them sound! She has approximately 15 toys and knows them all by the name I give them when I give them to her. Sometimes having a mind of her own, when I tell her to go get a certain toy she'll walk by it and touch it with her nose to let me know she knows which one it is, but that another toy is what she'd rather have at the moment! One of her favorite things is to play keep-away. She acts like she is going to bring it and release it but at the last second she turns to keep me from getting it. I have to be very patient when I take her for her daily walk as she likes to stop and sniff a lot "smell the roses". Once we've gone a certain route a few times she knows all the scents and moves along. Obviously I'm very fond of Ginger. She's a loving dog that loves everyone she meets, and they love her back. People say that she has "very kind eyes". Hopefully I can upload a picture of Ginger. 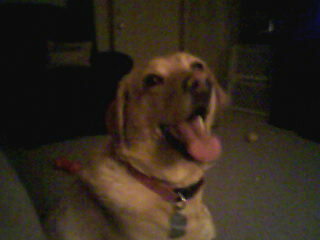 Not a great picture because I took it with my cell phone, but it looks as if she's smiling for the camera. Wish I had another, probably a male, of the same breed as a friend for her. Thanks for your comments about Brodie. Just to let you know about cycling, I started really slowly with him and got an extension pole(Springer)which keeps him safe and close to me when we are out. If he pulls to go see or smell something it only causes a small pull on the bike which means I stay on and he stays safe. I also stop at least once to let him do the sniffing about he thinks he needs to do to everything!!! Good luck with the bike and Ginger! Ive got a black lab (Brodie). I got him at four months old and he like Ginger knows the name of his toys. He will go and get what I asked for or touch the toy I have asked for and look round to me as if to tell me he knows what I want. But if he wants to play with something else he will bring that to me instead. He's great fun and when I'm out I can't wait to get home to see him. Lots of people say that dogs don't know what you are saying to them but I think Ginger and Brodie and probably a lot more labs prove them wrong. Hi Howard and thank for sharing ideas regarding labs...at least I know now that labs would not spare anything, I mean anything that they can chew on...my lab do shed as well but it's seasonal. You are right when you said that they would not want to eat their dog food and wanted "our" food. I am usually giving her Eukanuba but she doesnt like it anymore. I tried giving her eukanuba with pedigree, the canned one, but she will just lick the pedigree and leave the eukanuba alone...so i just mixed the pedigree with rice....she was also trained but she's just so hyper...i hope you could post other pictures of Ginger....hope to hear from you soon!